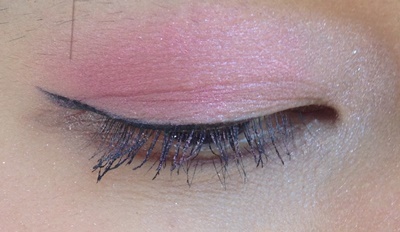 For eye shadows, I used Lavshuca Heart Palette PK. As Japanese eyeshadows go, the colour is usually gentle and light (so it would look even lighter and more transparent than what I have in the photos). 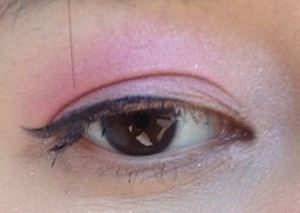 To emphasize on the red/pink tone, I mixed in some pink blush (pure pink colour) and blend it with Nars shadow Grenadine. The colour is of a matte finish which may appear too flat on my Asian features. So shimmer/glitter to the rescue (superhero theme song). I used Urban Decay Naked 3 – strange and dust– to highlight both corners of my eyes. Make them pop! Finally, I used Black Eyeliner by Maybelline to create a wing liner, slightly lifting upward so that our eyes don’t look “puffy” or “swollen” because of the pinkish hue. Apply your mascara and we are done! Woohoo! 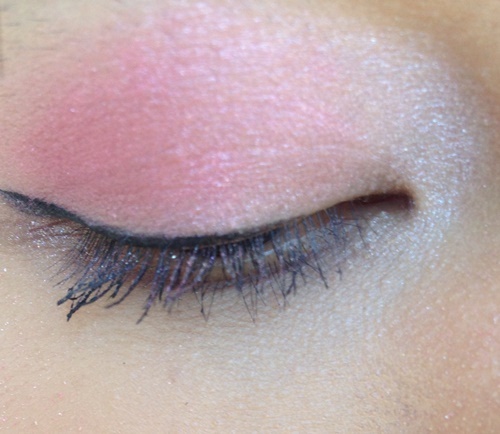 Usually, people are intimidated by red or pink tone eye shadows because of its difficulty to wear. It is not an easy colour choice I have to say. If you don’t blend it well or add a strong liner colour, your eyes can look swollen or puffy easily – which would be an undesirable look to wear out. Practice make perfect. There’s no perfection without some frustration. 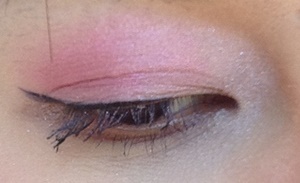 I use to shy away from red/pink shadows but now NO MORE. This Canada Day– challenge yourself. Take out the most difficult eye shadow colour from your makeup kit and go crazy.